In 1969, while hippies pranced about the farm fields of Woodstock, New York with flowers in their hair, Birmingham, England was giving birth to a monstrous new musical genre that came to be known as heavy metal. A group called Black Sabbath released its first album that year, and while others both in the United States and England were flirting with the heavier side of rock ‘n’ roll, it was that band that nailed metal squarely between the eyes. Five years later, Birmingham’s fertile musical loins produced another heavy metal monster, one that came to rise just as high as the first, and perhaps, at times, was even more nimble. The vocals soared over others, the songs galloped faster, and two lead guitarists were used rather than one. That band was Judas Priest. Amazingly, both Birmingham groups have reformed after varying hiatuses and are touring together this summer with Ozzfest, still playing the aggressive, distortion-heavy songs they wrote decades ago in front of fanatical, sellout crowds around the world. Recently, Rob Halford, the outspoken lead singer of Judas Priest, was kind enough to talk with Maximum Ink about his recently reunited band as well as the resulting tour and musical releases. Eventually, while Rob Halford worked with other bands, Judas Priest found a new singer in Tim “Ripper” Owens, an American with amazing vocal abilities and strong stage presence. Owens filled the vacancy in ‘Priest well. Yet, the fans wanted the original lineup as they always do and 2004 finally seemed like the right time for the original lineup to reunite. The group returns to Wisconsin on August 14th as Ozzfest takes over Alpine Valley. “We go way back with Wisconsin. It was one of the first states in America that really took Judas Priest to heart and we’ve never forgotten that. Whenever we come back to that part of the country, it’s always a good feeling, and we always have a good time.” The tour is doubly important to the ‘Priest members because they are co-headlining the main stage with Black Sabbath. 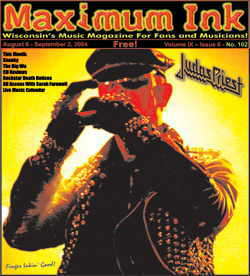 Halford’s nickname, The Metal God, comes from the group’s popular song of similar title, and he doesn’t take it lightly. “All my leather clothing weighs close to 30 pounds,” he says. “That’s my workout. I don’t go to the gym, I just go on stage and work out. It’s pretty grueling.” The effort is made not only for the cardiovascular exercise, but because of a true appreciation and love of the fans that Halford and his bandmates have always possessed. “We wear the leather,” says The Metal God, “because it’s important to the fans. It’s a uniform, and the look is uniting in a sense. The picture is complete. The imagery matches the music.” In the end, this is what all fans want - to be entertained, but also to be reassured that rock ‘n’ roll is alive and well. With Black Sabbath and Judas Priest stomping the terra firma together on the Ozzfest tour, there is no doubt that heavy metal is in top form. And if heavy metal is riding high on the horse, then the saddle of rock ‘n’ roll is well-oiled and firmly strapped in place.